Tridentis AMV successfully complete a Phase I SBIR for the Office of Naval Research, where we performed the concept design of a high-speed ship to shore connector. 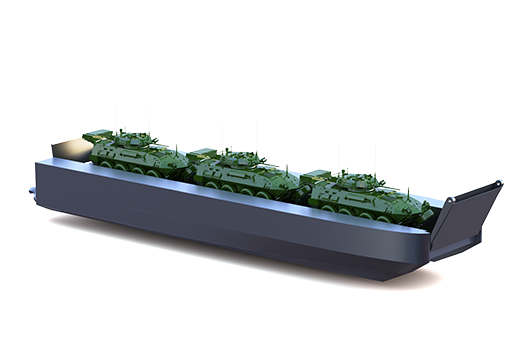 Specifically, Tridentis AMV designed a high-speed Surface Effect Ship (SES) to be used as a ship-to-shore connector, interface with US Navy Amphibious Assault Ships via the well deck, and carry military assault and logistics vehicles from over-the-horizon locations to the beach. A full conceptual design was performed to look at the viability of a small SES to lift a vehicle load consistent with an AAV-7. The design looked at the structural, mechanical, and performance aspects to determine viability. Once done, the craft was analyzed as to well deck interface, and subsequently two scaled versions were generated that maximized the use of the well deck, specifically that of the LPD-17. Once the performance characteristics were determined for the scaled versions, a model was developed to determine vehicle throughput in terms of vehicles/hr/LPD-17 as categorized by vehicle type. Our design showed superior vehicle throughput over an LCU-1600 or two LCAC. Due to our novel concept that maximizes well deck area and high-speed SES technology we are able to deliver more vehicles to the beach quicker than any planned or existing vessel in the US Navy inventory.